The specialist developed synthetic fibre fills performs in the same way as badger hair and with quality shaving soap or shaving cream develops an excellent wet shaving lather. This is a premium synthetic alternative to natural badger hair every densely filled synthetic silver tip fibre bundle/knot/shaving brush head is hand made. Each brush can retain optimum amounts of hot water to create a rich, luxurious shaving cream or soap lather for perfect wet shaving. The other key benefit is that the brush dries very quickly and is extremely resistant to problems associated with lather residue in natural badger hair brushes. These features make the Silvertip Fibre® brush remarkably durable for daily use and especially for travel. 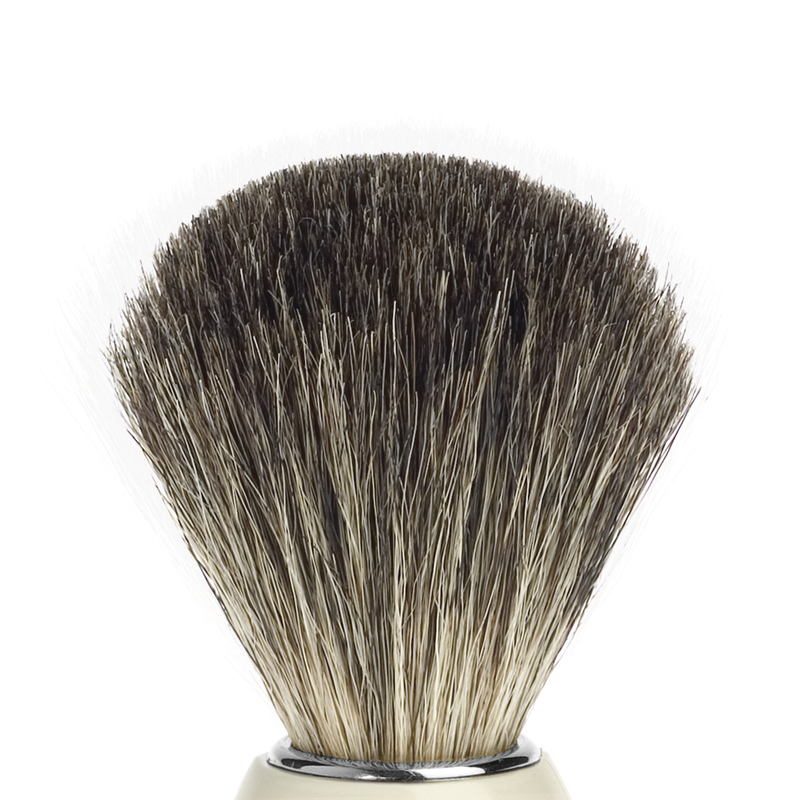 The soft, densely filled, shaving brush head means a synthetic silver tip Fibre shaving brush is now the first choice for many discerning wet shavers. The Synthetic Silver Tip fibre used is a fine machine extruded polyester, thermoplastic polymer filament. It is very robust and is highly resistant to wear and discolouration and the soft feel and texture does not deteriorate. During manufacture graduated colouration is applied to the polyester fibres to closely resemble the natural colour of real silver tip badger hair. To closely mimic the feel of silver tip badger hair, each individual fibre is extruded with a natural, built in flex point and the precision machined taper near the tip is designed to guarantee ultra-soft and flexible performance. The carefully calculated diameter of each special fibre closely matches the diameter of natural silver tip badger hair. This is a standard, synthetic and affordable alternative to pure badger hair and each black synthetic bundle is machine made. The black synthetic fibre retains hot water which, when combined with shaving cream or soap, can create a creamy shaving cream or soap lather perfect for wet shaving. The other benefit is that our synthetic brushes dry very quickly and are extremely resistant to problems associated with lather residue in natural badger hair brushes. The brush will soften over time and in use gently massages the face during lathering. These features make a synthetic fibre brush remarkably durable for daily use and especially for travel. 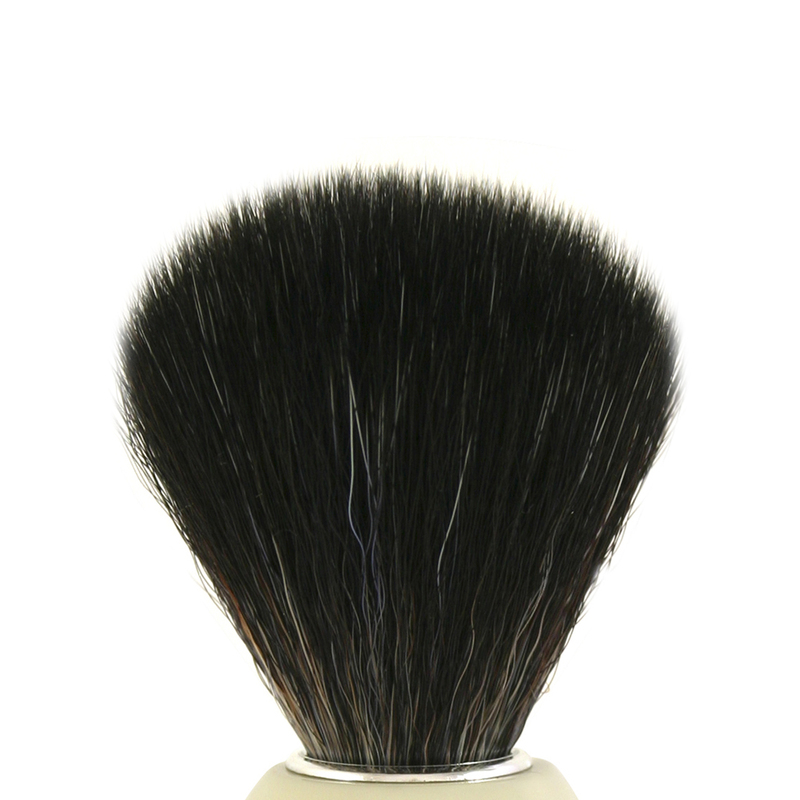 Black Synthetic Fibre shaving brush is now the first choice for many wet shavers. The black synthetic fibre is a machine extruded polyester, thermoplastic polymer filament. It is very robust and is highly resistant to wear and discolouration and the feel and texture does not deteriorate. During manufacture black colouration is applied to the polyester fibres and, combining it with occasional white fibres, it closely resembles the natural colour of natural pure badger hair. Each individual fibre is extruded with a natural flex point designed to guarantee flexibility and equally good performance characteristics expected from natural badger hair. The carefully calculated diameter of each special fibre closely matches the diameter of pure badger hair. Badger Hair has been used for more than two centuries to make the best shaving brushes; in the past it was the preserve of the wealthy, now it is available to everyone. Badger hair is quality graded according to the appearance and softness of the hairs; the ascending classifications are Pure, Best, Super and Silver-tip. The price of a brush will depend on the quality of the hair and the amount it used in the brush; it is an expensive resource and the highest standards of quality control are used when the hair is sourced. The hair is cleansed and sterilised to ensure that it is not only clean but performs to meet user expectations. Why Badger Hair is chosen? Badger hair is different to animal fur. Like human hair, badger hair absorbs water and it is this characteristic that makes badger hair perfect for shaving brushes. The lathering process whips hot water, soap and air into a warm foam that cleanses the skin and lubricates the path of the razor. Water is the key element in a good shave and the more a brush can hold, the better the lather and shave will be. The fine tips of the hairs help to make a smooth and creamy lather and the exceptional softness of badger hair cleanses the face gently, giving a comfortable and reliable shave. Silver tip badger hair. This is the highest quality available. The finely graded and sorted badger hairs are the softest, rarest and most expensive badger hair of all; with natural untrimmed silver tips, it is used for the most luxurious shaving brushes and give the softest, richest lather and shave. The exquisite appearance of this hair is enhanced by careful hand grading of the individual colour hairs and hand selection for each badger knot. The shape of our silver tip filled brushes is also created by hand. The long hairs from under the neck of the animal are ultra soft, flexible and will provide years of luxurious shaving. Super Badger. This is the fine hair from the back of the badger, it is longer and softer than best badger and, because it is finer, requires more hairs to fill each brush. This high quality grade of badger hair is only used in hand filled brushes. Visually, the badger bundle displays a distinctive black band capped with pure white tips and is presented in a natural fan shape, using the natural hair ends to create the shape and softness. The shape of Edwin Jagger Super Badger filled brushes is created by the skill of the knot maker; the hair is not trimmed the hairs to create the overall badger bundle shape, a time saving method used by some suppliers. Best Badger. 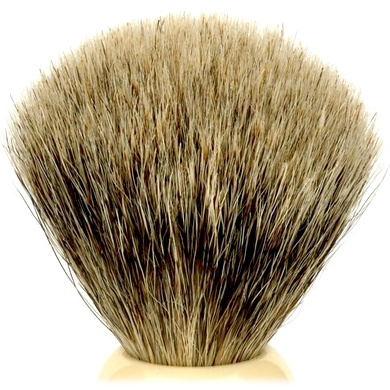 This is a very good quality of badger hair and is the most commonly chosen.It is normally regarded as the benchmark standard for shaving brush manufacturers. The hair is harvested from the majority of the pelt, including the underside. It is generally darker in colour although the colours of individual hairs vary from grey and brown to black. 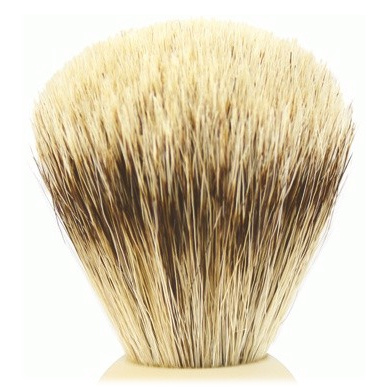 This quality creates lather far superior to that resulting from the use of a bristle brush. The feel of a best badger brush is rather firmer than that of Super or Silver Tip and this may be better for anyone with coarser beard hair. Pure Badger. This effective quality of badger hair is generally used for many factory made shaving brushes. Pure badger shaving brushes are gerenally the least expensive of all badger shaving brushes so are very affordable and can give years of excellent service. This is an ideal quality for many new wet shavers and allows the user to practice creating a shaving lather and realise the benefits of shaving brush use. 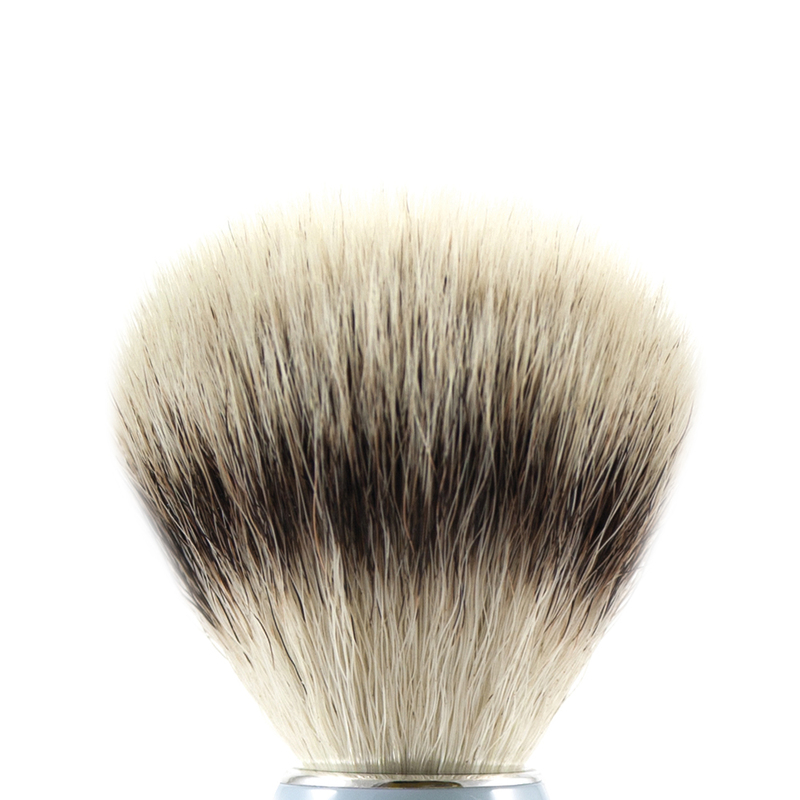 Many continue to use a Pure badger shaving brush for years and prefer the firmer feel of this quality. Depending on the size, e.g. 19,21,23,25m, an average brush contains approximately 14000 hairs, weighed precisely to fit the securing ring that holds the brush knot together. The manufacturing process is highly skilled and most of the work is done by hand using traditional tools and skills. The 'bundle or knot' of hair is combed to remove any hairs not lying straight. The hairs are then positioned tip-first into a heavy metal forming block which has a concave interior to give the distinctive 'dome' shape of a quality brush. The straight end of the bundle is tied off securely with strong thread and then glued into the securing ring. This fixes the hairs in the finished shape of the brush. The base or 'shaft' end of the hairs are sheared off. The hair tips are never cut as it is the fine tips that give the softness in a brush of true quality. The clamped bundle is then carefully cemented into each brush handle, creating a luxurious shaving brush that will last for many years. 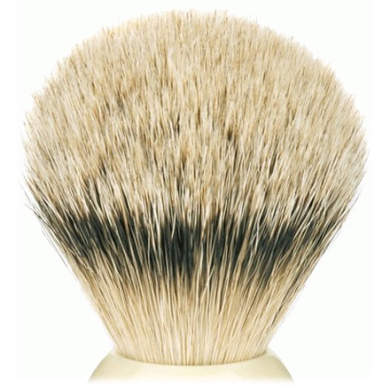 A badger hair brush is a natural product that with the right care should last ten to fifteen years. When you get a new brush it is quite usual for some loose hairs to shed in the first few weeks; these are shorter hairs that did not quite reach to the glue in the base and this should not be a cause for concern. Wet your brush thoroughly in warm water before use. Dip the tip of the brush into the shaving cream or soap and lather gently using a light circular or up and down motion; when applying the shaving cream or soap do not apply too much pressure as this will cause the badger hair to splay. After shaving, rinse the brush gently but thoroughly in clean water, shake as much excess water out as possible and hang the brush in a stand with the hair pointing down. If you do not have a stand, leave the brush standing, rather than horizontal, so that air can get to all the hairs and dry the brush naturally. Over time, natural hair, left wet, may develop mildew; try to avoid leaving a wet brush in an enclosed space. If you keep it in the bathroom cabinet ensure that there is enough space for it to dry. If you wet shave away when travelling, and keep your shaving brush in a travel tube or kit bag, give it an opportunity to dry as soon and often as you can. If your brush becomes affected by mildew or a buildup of soap, clean it very thoroughly usuing a paste or solution of Borax, which can be obtained from a hardware shop.